Whether you’re at home relaxing or on the go, the Linx V-range 10.1-inch 2-in-1 tablet is the ideal way to keep yourself entertained and productive. Featuring a ultra-fast processor, gorgeous 10.1” capacitive touchscreen, windows 10 home OS and free detachable keyboard. If you want a tablet that can easily transform into a laptop then the Linx V-Range tablet is for you. Whether you want a portable entertainment system for watching your favourite shows or a portable workstation for completing projects and tasks, the Linx V-range 2-in-1 is the perfect way to get the best of both worlds. 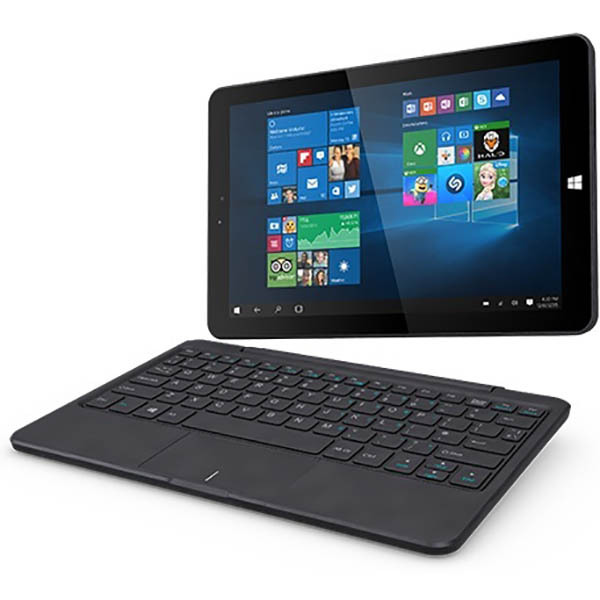 Featuring a complete version of Windows 10 Home edition, beautiful 10 inch colour display, clip on keyboard cover and high performance processor, the Linx V-range 2-in-1 tablet delivers a range of functions for efficiency and enjoyment. The tablet/keyboard cover features an integrated kickstand made from refined aluminium, this allows you to view hands-free when watching your favourite movies, playing games or keeping productive with the included Microsoft Office suite. This sleek keyboard cover seamless transforms your tablet into a premium looking laptop, ready for you to make the most of its internal functions and the windows 10 OS. The full qwerty key layout, unique individualistic island keys and gesture supported track pad sit on the keyboard cover. So you keep the portability of a tablet with the flexibility of a laptop. Fitted with a gorgeous 10.1” IPS LCD display, the screen offers a Full HD 1280x800 resolution with a pixel density of 149 pixels per inch. Thanks to the capacitive touchscreen you’re able to get the best of both worlds, in terms of being able to complete work related tasks easily. The colourful display is a pleasure to the eyes, reproducing contrast ratios with true-to-life quality and delivers vast amounts of details. Perfect for watching your favourite movies, playing games or formatting presentations. Powered by the Intel Atom X-5 chipset, the quad core processor combined with 2GB of RAM allow you to quickly load demanding applications, work on multiple windows at the same time and even play the latest 3D games thanks to the Intel HD graphics. Performance is ultra-smooth and highly responsive, resulting in a lightning-fast tablet that rarely lags or freezes. The tablet comes with 32GB of internal memory for storing your media, applications and work. This can be expanded on further with up to an additional 200GB via the integrated micro SD card Slot. The Linx Tablet is kept alive with its 5,800mAh Li-Ion battery, lasting approximately up to 8 hours. Ideal if you want a device that can keep you entertained on a long commute or a device that can work as hard as you do. Samsung Galaxy Book 2-in-1 Tablet Laptop 10.6"